LONDON -- Roger Federer's wait for No. 8 at Wimbledon is over. He is once again the champion of the grass-court Grand Slam tournament, now more often than any other man in the history of an event first held in 1877. Federer won his eighth title at the All England Club and 19th major trophy overall, capping a marvelous fortnight in which he never dropped a set by overwhelming Marin Cilic 6-3, 6-1, 6-4 on Sunday in a lopsided final that was more coronation than contest. When it ended, with an ace from Federer after merely 1 hour, 41 minutes, he raised both arms overhead. A minute or so later, he was sitting on the sideline, wiping tears from his eyes. Truly, the outcome was only in doubt for about 20 minutes, the amount of time it took Federer to grab his first lead. Cilic, whose left foot was treated by a trainer in the late going, was never able to summon the intimidating serves or crisp volleys that carried him to his lone Grand Slam title at the 2014 U.S. Open, where he surprisingly beat Federer in straight sets in the semifinals. This one was all Federer, who last won Wimbledon in 2012. That seventh championship pulled Federer even with Pete Sampras and William Renshaw in what's still officially called Gentlemen's Singles. Sampras won all but one of his in the 1990s; Renshaw won each of his in the 1880s, back in the days when the previous year's champion advanced automatically to the final and therefore was able to successfully defend a title with one victory. Federer had come close to bettering his predecessors but couldn't quite do it. He lost in the 2014 and 2015 Wimbledon finals to Novak Djokovic, and in the semifinals last year after erasing match points to get past Cilic in a five-set quarterfinal. With clouds overhead and a bit of chill in the air, the very first game offered a glimpse at Cilic's apparent plan: go after Federer's backhand. All five points won by Cilic in that opening stanza came via mistakes by Federer on that stroke. Conversely, all three points won by Federer in that game were thanks to forehand miscues by Cilic. Understandably, there were signs of nerves for both. Federer's early play, in general, was symptomatic of jitters. For everything he's accomplished, for all of the bright lights and big settings to which he's become accustomed, the guy many have labeled the "GOAT" - Greatest of All Time - admits to feeling heavy legs and jumbled thoughts at important on-court moments to this day. And so it was that Federer, not Cilic, hit a double-fault in each of his first two service games. And it was Federer, not Cilic, who faced the match's initial break point, 15 minutes in, trailing 2-1 and 30-40. But Cilic netted a return there, beginning a run of 17 points in a row won by Federer on his serve. It was as if the first indication of the slightest bit of trouble jolted Federer. In the very next game, Federer broke to lead 3-2 with the help of three errors by Cilic and one marvelous point. Cilic tried a drop shot, Federer got to it and replied at a tight angle. Cilic got that and offered a slick response of his own but slipped and fell to the court, allowing Federer to flip a winner, eliciting roars from the crowd. Federer broke again to take that set when Cilic double-faulted, walked to the changeover and slammed his racket on his sideline chair. Cilic then sat and covered his head with a white towel. After Federer raced to a 3-0 lead in the second set, Cilic cried while he was visited by a doctor and trainer. At that moment, it wasn't clear, exactly, what might have been ailing Cilic. During a later medical timeout, Cilic's left foot was re-taped by the trainer. Federer would break to a 4-3 edge in the third set and all that remained to find out was how he'd finish. It was with his eighth ace, at 114 mph, and he raised both arms overhead. 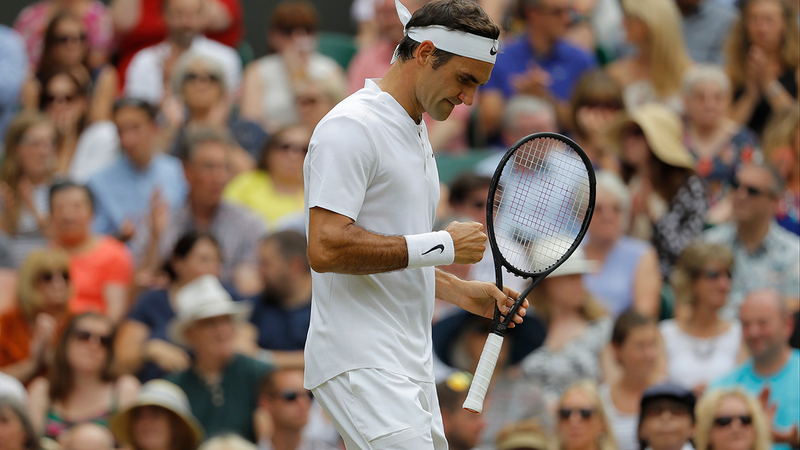 This caps a remarkable reboot for Federer, who departed Wimbledon a year ago with a lot of doubts. He had lost in the semifinals, yes, but more troublesome was that his body was letting him down for the first time in his career. Earlier in 2016, he had surgery on his left knee, then sat out the French Open because of a bad back, ending a record streak of participating in 65 consecutive Grand Slam tournaments. Then, after Wimbledon, he did not play at all the rest of the year, skipping the Rio Olympics, the U.S. Open and everything else in an attempt to let his knee fully heal. It worked. Did it ever.